David Van Buskirk, Emeritus Professor of Psychiatry at the Medical College of the University of Vermont, has spent years photographing indigenous people, weavers, villages and textiles in Central and South America. His photographs of Peruvian weavers and children have been exhibited at the University of Vermont, the Fleming Museum, Peabody Museum of Archaeology (Andover, Massachusetts), Hunter Arts Festival (Hunter, New York) , San Francisco State and elsewhere. The photographs are part of a many-faceted effort to document traditional textile arts and to encourage Quechua-speaking Inca weavers to continue their work. For the first ten years he served as founding Co-Chairman of the Board of Directors of the Center for Traditional Textiles of Cusco. You can view the diversity of his highly acclaimed photography on An Eye For Life And Image. 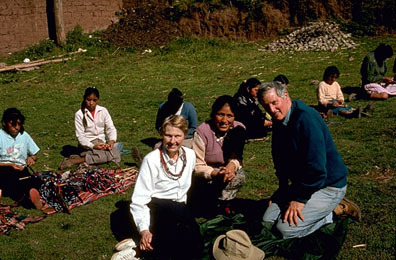 Elizabeth Van Buskirk, a writer, teacher, weaver and specialist in Inca culture and history, has traveled to Peru and Bolivia on many occasions doing field research on Andean textiles. She won the Barbara Karlin grant award from the Society of Childrens’ Book Writers and Illustrators for a children’s picture book story about an Inca child and family. Van Buskirk gives presentations and lectures at schools and universities and acts as a consultant on curriculum related to South and Central America. She has taught courses at the University of Vermont on the Incas and ancient civilizations of South America. Elizabeth Van Buskirk was the kit developer and writer of the University of Vermont Fleming Museum traveling kit, “The Incas, Past and Present.” She was the founding co-chair and served for the first ten years on the Board Of Directors of the Center for Traditional Textiles of Cusco.